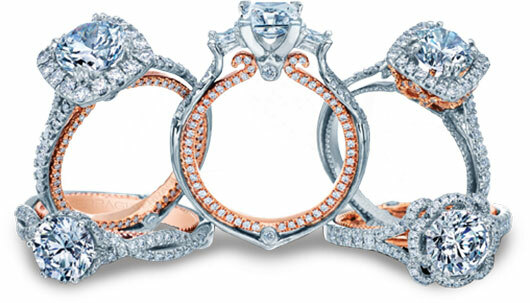 There is a bridal jewelry collection that’s like the Little Black Dress, perfect for anytime, anywhere: Verragio’s Couture engagement ring settings and wedding bands! The diamond-intensive semi-mounts feature an exclusive flower halo, Diamond Riviera, a pointed bottom shank and French beaded upward scrolls at the Verragio crest. A simpler, cleaner profile is presented in the pretty pieces. Sleek and streamlined, customization of components in white gold, rose gold, and yellow gold are available to you, to make your ring as unique as you are!